Have you ever gotten caught in a downpour with a water resistant jacket instead of a water proof one? We’ve been there too. For those who haven’t, the result is simply not fun. It’s the little details like that which prove to be big when you’re actually outdoors. If you’re reading this, maybe you’re getting ready for a longer trip outdoors or are moving your work out from the gym to the streets and you’re here looking for advice on a great rain jacket to avoid more mistakes like the one above. Awesome! We’ll go into the important things to consider and understand when you’re looking at racks of colorful nylon so you don’t get overwhelmed by options or underwhelmed by your final purchase. Then, we’ll go over the seven best rain jackets for men on the market right now, so you get a summary on what’s out there and what the best options are. This way, there’s always a bit of sunshine on the rainy days. Rain jackets come with a lot a variety. From the less important features like color to the extremely important features like fabric, there’s just a lot to choose from. There aren’t exactly clear cut testing standards to go by when choosing products either, no how breathable or how waterproof. That’s why a lot of people stick with what they know or what their friends know. We’ve compiled the facts as best we can so you can understand the language companies are using for yourself. You need to understand what it means for your rain jacket and therefore your adventure needs. “Air permeability” is the scientific term for breathability, and either term can be found among rain jacket descriptions. Sweat vapor wants to transfer through the jacket to the colder, drier, outside air. The efficiency of this process can be altered by the fabric between your sweat and skin and the air. There’s not universal measurement or testing standard for air permeability. Keep in mind that the more breathable a jacket is, the colder it can be too because it’s letting out warm air indiscriminately. You may find yourself purchasing the most breathable jacket around but layering it with a fleece underneath. This could impact other buying decisions like the size of the jacket, for example. Gore-Tex is well known for providing impeccable weather protection. It has three layers (membrane, lining, and outer fabric) that are bonded together as a laminate to keep you dry. Keeps rain from getting to your skin but also works to move your sweat to the surface of the jacket. Meant for intense conditions like driving or sideways rains. Can handle light rain for short periods of time. Lighter weight than a waterproof jacket. What you should choose depends on where you go and what you want to do! There are some additional things to consider if you want a fully waterproof jacket, though. All waterproof jackets are made with fully taped seams, it is part of what makes it waterproof, not water resistant. Seam tape however, does not mean it’s a waterproof jacket. Many water resistant jackets are seam taped. Additionally, Water can get through the teeth of a zipper. To prevent this from happening, you’ll want either a storm flap or a rubberized coating on the teeth. To save weight, you might want to go with a coated or laminated zipper, but they are harder to zip and use a cover (known as a hut or garage) to shield the opening at the end of the zipper track. Also worth noting, over time the coating will wear down and become ineffective. Wind resistance and windproofing are another important feature to consider when buying a rain jacket. Windproof jackets don’t lend wind through at all, and they are also waterproof. Wind resistant jackets, on the other hand, are similar to water resistant jackets in terms of weight. When considering wind resistance, take a look at vents. You might find yourself wet from your own sweat because your jacket is so good at keeping the weather out, but not allowing for water to escape. If that’s the case, you might be interested in vented jackets. Pit zips, as they’re commonly called, unzip under your underarms to offer venting. Some jackets have zippers alongside the torso for further ventilation. These areas are usually mesh, not just open space, when unzipped. The last consideration before buying is the extra features you want. First, think about pockets. Pockets, especially ones that come with waterproof zippers are one feature of a jacket that will directly impact the price of the jacket. Some pockets are designed to fall above the hip belt and away from backpack straps, features that might take precedence for a backpacker. Some jackets also feature pockets that are hidden under storm pockets for extra protection from the weather and pick pockets. Another feature backpackers might want to focus on is packability. This means that the jacket can fold up to a small size and likely into one of its own pockets. If a jacket is packable, you know it’s going to be lightweight as well. Now that we’ve gone over what you need to think about before buying, let’s take a look at the products! The Patagonia’s Alpine Houdini Jacket is designed to stand up to tough weather conditions when you’re moving fast. Trail runners and rock climbers will love this jacket for its light weight. The nylon has been treated with durable water repellent coating and it blocks wind so whether skies are clear or not, you’re able to enjoy the great outdoors. It’s a slim fit so ordering a size up might be a good call if you’ve never worn Patagonia before. Slim fit will make it more difficult to wear over certain layers as well. The cuffs on this jacket are elastic and there’s a single drawstring at the back of the hood to adjust how tight it is around your head. There’s a single pocket on the chest so your hips are clear if you’re backpacking which is a neat feature. This pocket also acts as a stuff sack for storage when you’re not wearing it and want to save space. 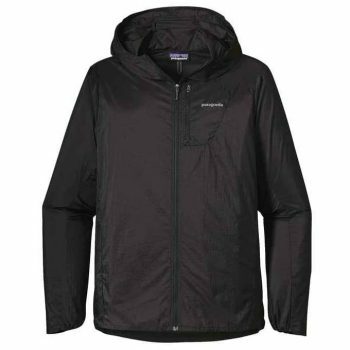 Related: For another water resistant jacket with a little more warmth, check out Patagonia’s Torrentshell Jacket. It also has great breathability and goes great with most helmets. The Marmot Essence Jacket is a lightweight shell with elastic at the sleeves, not Velcro. Its athletic fit makes it not baggy but it is large enough to have layers on underneath. The hood fits well over helmets and hats, making it a popular choice for those who like to layer or need to wear a helmet. It features an athletic fit which should have no problem fitting for the average person. Because his jacket has some elastic and stretch to it, it’s very comfortable and breathable. One common complaint from consumers is that the inside wears out quickly and it’s not the most durable. This jacket does not have hand pockets. Overall, it’s a great waterproof jacket that you can get for a great price. 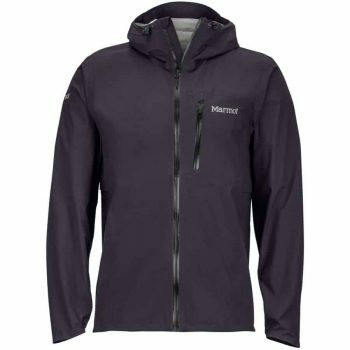 Related: For a water resistant alternative to the Essence, check out the Marmot Men’s Gravity Jacket. Aside from being a cool looking jacket, it features two front slit pockets and two zip pockets for better versatility and utility. The Arc’teryx Zeta LT Jacket is trim fitting and is cut to feature more elbow room and gusseted underarms. The StormHood is baseball hat style with a laminated brim and has an adjusting drawstring and a chin guard. The pocket has a laminated zip and the hand pockets also feature watertight zippers, which are highly water resistant but not waterproof. The hand pockets are well placed, especially when wearing a day pack but it’s worth noting that the inner pocket is very small, barely big enough to fit a smartphone. The Velcro cuffs on this jacket help to reduce bulk. This jacket has three layers of Gore-Tex technology to shield you from the rain and its Gore C-Knit backer technology keeps your skin feeling dry and smooth instead of sweaty and clammy. 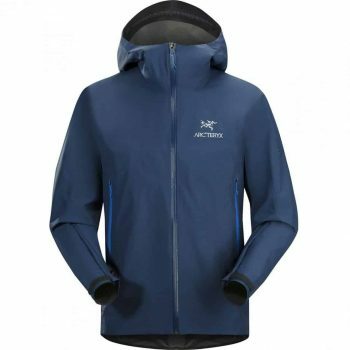 Related: If you’re looking for a hybrid jacket that can be used as a wind breaker and rain coat, the Arc’Teryx Men’s Beta LT Hybrid Jacket should make for a great purchase. The jacket provides great protection for the wind and rain. 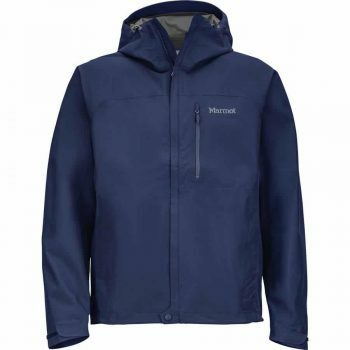 The Marmot Precip Jacket is lightweight, packable, and breathable. The hood can fold into the collar of this jacket as well. There are pit zips on this jacket, adding to its breathability, but some users have noted that the zippers are small and difficult to find. It’s a slim fit jacket which is important to keep in mind if you like to layer underneath your jacket or are a bigger guy. Many users recommend buying a size up from what you’d normally buy. The pockets on this jacket are large enough to fit a water bottle. A common complaint on this jacket is that it’s interior lining disintegrates after relatively little or gentle use and the ventilation situation. Related: If you have decided to get the Precip Jacket, you should also consider getting the Marmot PreCip Pant which is made from 100% nylon and has accessibility features like the ankle side zips and more. The Arc’Teryx Beta SL Jacket’s PacLite is guaranteed to be waterproof and breathable, enabling you to have all sorts of adventures. Because it can be packed down to size, it’s perfect for backpacking or just about any activities that will require you to pack a lighter jacket. 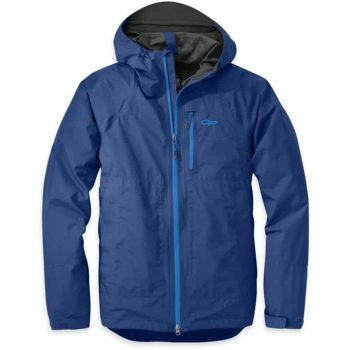 It lacks some of the comforts other jackets provide like armpit zippers and hand warmer pockets, so it is meant for an outdoor enthusiast with a more simplistic style and needs. It’s a bit bulkier than some of the athletic fits of other rain jacket contenders but this makes it easier to layer clothing underneath. What makes this jacket standout is definitely the shell which is made of Gore-Tex Paclite which provides the much needed rain protection without sacrificing weight savings. Lightweight, comfortable and just about the right price, this rain jacket is surely looking to be a winner. Related: Want a more affordable jacket that will protect you from unexpected bad weather? 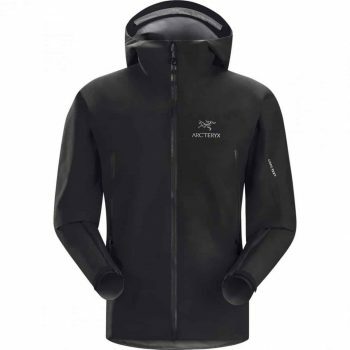 The Arcteryx Squamish Hoody should fit the bill nicely. It is made from durable mini Ripstop textile and air permeable PU coating for superior wind and moisture protection. 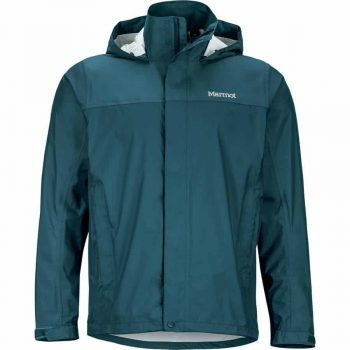 The Marmot Minimalist Rain Jacket is a great rain jacket choice for the committed outdoorsman. Its 2.5 layers of Gore-Tex PacLite is engineered to be lightweight, making it easy to carry, wear, and pack into its own pocket. It’s got a micro seam allowance to also save on weight and increase breathability. It’s also windproof for those days on the tops of mountains or on the water. This jacket is a slim fit and features Velcro cuffs so it stays close to your body and is great for layering. There’s a mini stormflap that protects the front zipper and a chin guard to protect you from zipper abrasion. The PitZips feature helps regulate your temperature and moisture that naturally build up inside the jacket. The hood is adjustable, with a drawcord hem and the cuffs are also adjustable with hook and loop design. Because Gore-Tex is so water resistant, sweat can build up quickly if this jacket is worn unventilated. Another downside of this jacket is that Gore-Tex stains easily. Related: A minimalist rain jacket deserves to be paired with a minimalist pair of pants. In that case, the Marmot Minimalist Pant with its 100% seam taped and Paclite technology is highly recommended. The Outdoor Research Foray Rain Jacket is a jacket you can depend on for rain protection on the trail or in the city. It transfers moisture away from the skin, allowing it to evaporate on the surface. Outdoor Research used the lightest, most breathable, Gore-Tex available and uses TorsoFlo technology. This jacket also has the largest pit zips on the market. This jacket is thoroughly vented to say the least. TorsoFlo means that there are hem to bicep zippers which can transform this jacket into more of a poncho on very hot days. The hood on this jacket has a brim and is fully adjustable and can cinch around your face. The two pockets on this jacket are positioned above a harness or waistband for accessibility. There’s also a Napoleon chest pocket that zippers. Related: For a more affordable jacket, the Outdoor Research Men’s Helium II Jacket might just be what your wallet will prefer. For only about $160, you get a 100% waterproof, highly compressible and super breathable jacket. When the sky turns dark and the clouds loom overhead, you won’t be the one worrying. Now that you understand the basics of rain jacket technology, you’ll be able to purchase the best option for yourself. No more chilly, water logged clothes for you! Whether you’re looking for lightweight or for more insulation, you’ve got options when it comes to rain jackets. You won’t need to compromise style for comfort either, with many different jackets coming with a variety of options on pockets and hoods as well. What’s your favorite rain jacket? What do you look for when you’re picking your next one out? Comment away below!